B-Sides: The Origin of the Dusted Bunnies, the latest in the Hopeless Savages series, is a shorter sampler than the other graphic novels. 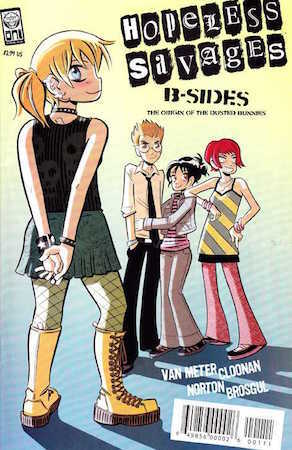 It contains three flashback stories, all written by Jen Van Meter, about Zero’s friends and bandmates. “Flora” (art by Becky Noonan (Demo)) shows the origin of the band, set against a backdrop of preteen exclusion and school politics. Flora’s somewhat pretentious, with the vocabulary of a Dawson’s Creek refugee, but she’s got an in-story reason: Mom’s a shrink. The look of Cloonan’s characters swing from punk to lovely to monsters, appropriate for mercurial teens. “Emma” (art by Vera Brosgul (Flight)) flashes further back, with a kid Zero finding a friend at an unexpected location: the comic store. It’s set in 1989, and the comic book titles of the time, dropped into the dialogue, make it sound like a modern golden age. What memories! Emma’s the niece of the store owner, and she’s completely lovable. She constantly says what’s on her mind, only belatedly realizing that she might sound rude and apologizing. She’s ostracized by other kids because they think comics are weird. She’s all big eyes behind glasses and closed-up body language. And she’s read everything in the store. “Tobey” (art by Mike Norton (Queen & Country)) is even more adorable, since it’s based around baby Zero. Her vocabulary, as she’s learning to speak, is impressive, with random utterances that demonstrate (with thought) how hard the writer’s worked to create the effect. Norton’s characters spark with expression, especially when they’re at odds, or when Zero is toilet training. It’s almost magical, the effect cute kids have on battling adults. I said this about the last book when it came out, but I think this is my favorite Hopeless Savages story. And that’s one of the amazing things about this series — it keeps getting better and better. Van Meter uses history and flashbacks, playing with time, in new and original ways. Who we were affects who we are; history is important, but it’s not a chain or a crutch.